Decent enough, but the invasions will make you go bankrupt on anything other than beginner within the first few years if not sooner. To give you an example, within 10 years I had close to 50 City Defense monuments, and at the end of the campaign I had 170 in my city and close to 400 unbuilt and I didn't do anything to "provoke" the enemies. The invasions were just to frequent and made it hard to get a standing army replaced quickly enough to defend. Every city has a military strength of 6 so you cannot conquer anything until the story allows it. I give this a 2 because the author got creative with the location of the cities. He used a simple "this spot on the world map needs a city and I'll select a random name and I don't care if Sparta is in the center of Attica or Troy isn't on the Hellespoint." Events include 20 billion invasions per year *exaggeration but still* and the same monster being slaughtered by Apollo multiple times over in each mission. 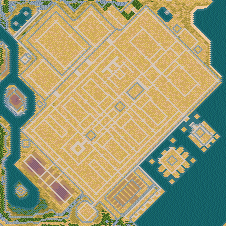 Top marks here because you can make a very nice beautiful city in the provided area. Only downside is that the roads are already planned out so without redoing the entire road system you are forced to place houses and buildings down to conform to the author's city layout. Riddled with grammatical errors, issues with punctuation, and spelling, the script could've been written by a 5 year old or google translate. Also, the author decided that the gods and goddesses needed to have every quest done from the Argent Maze to the the Mirror Shield be issued. Atleast Atlas and Hades decided to not give me their quests! Take some extra time and place the cities in the right spot on the map and get the names of the leaders correct. I modified the map myself and in under 20 minutes I had redrawn the trade routes, fixed names and city locations, as well as added 2 more cities and changed it so the Persians weren't in central Greece. It wasn't that hard to do. Also SERIOUSLY reduce the amount of invasions, place more invasion spots, vary the events and don't have someone endure 10 to 15 years of 6 to 10 invasions per year before they can conquer 1 city.